About 16 months ago a dear friend of mine and then-Chef de Cuisine at Giornotte at the Ritz Carlton in Abu Dhabi, Christian Antoine, showed me a picture of Chef John and said: Brandon, whatever you do, check out this guy - he is going to do something special.' 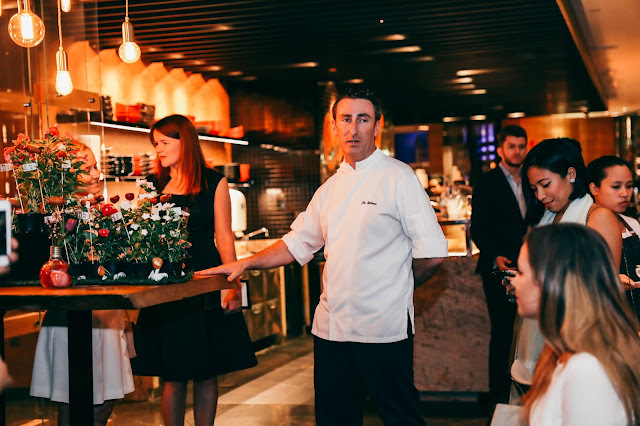 Chef Christian and Chef John had both part of the pre-opening team at Intercontinental Dubai Festival City in earlier years. Slowly, I started seeing images on social media. One image stuck in my mind is of him with a spray can doing graffiti on a wall. I had no idea how symbolic this image would prove to be. 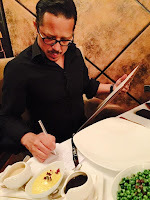 His restaurant, in which he is the CEO' Culinary Director and chef was born not so long after, and as I write this, I am torn between his story and my actual experience. I will try to delve into both. My evening starts as I meet his sister Jaime, who tells me that Chef will be hosting my guest and me at the Chef's Table. Already, I have realised that this is a chef who thinks out of the box. The Table is not what one would imagine - its bar style seating allow a fly-on-the-wall experience of Chef and his team cooking up ingredients, shouting out orders and acknowledging them. I learn very quickly that Chef has another sister also involved in the restaurant - one takes care of marketing and the other HR. This is not useless information. On the contrary, this indicates just how valuable relationships are in the restaurant. Chef's team is mostly people he has known for a long time and in some cases, people who were with him when was at Atlantis the Palm. One heartwarming moment is when I find out that his Deep fry chef, Narendra, was once his steward in Atlantis. 'What did you see in him that made you choose him?' I ask. 'Loyalty. He was very loyal to me and I value that above all things', responds Chef John. Mm. While sipping on a glass of Prosecco, I look at the menu. The first thing that is evident is the price point, making me recall one of Chef John's mantras that good food does not have to have to be expensive. The prices of dishes certainly supports that. With the exception of the paella that comes in three sizes, all dishes are around 15-70AED. In the Dubai context, that is unreal value. Dinner starts with a selection of appetisers. The Fake carpaccio is one of those dishes that plays tricks on the brain - I am loathe to spoil this for the guest. Just order it. We also have the Market ceviche - this changes depending on the catch of the day. On this night, it is Turkish sea bass. the highlight on the dsh for me is the calamansi, a citrus-like fruit no larger than a baby cherry tomato that is packed with intense citrus flavours. The kitchen is nicely set up and the positioning of the Chef's Table brings the kitchen right to the guest's plate. It is a Friday night and the restaurant is not packed, but the verve from the team in black - there is very little traditional anything about Chef John's approach to, well, everything. Cooking should be fun I imagine, especially if I was going to do it every day, and the relaxed dress of the chefs conveys exactly that. Soon, we tuck into a dish from the Grills, Pots and Pans section on the menu - the Palamos Octopus, probably my joint dish of the night. Tender octopus on a bed of what I can only describe as heavenly foamy mashed potato, chimichurri and for texture, crisps. Tying as my favourite dish is an Emirati inspired DXB short ribs, born of a visit Chef paid to a family. This is a great dish on so many levels. The story, firstly, and secondly, we do not have many dishes in high end mainstream restaurants that incorporate local spices. Finally, the ribs just fall off the bone but are still so beautifully textured. However, that sauce, oh the sauce. At the end of 2017 I was a guest panelist at the Middle East Food Forum in Abu Dhabi in which the panel looked at trends for 2018. Sustainability was one of those trends to look for. This is another box checked at Cuisinero Uno. My question is with a garden that small, just how sustainable is it? There is a variety of tomatoes, including heirloom, lettuce and other green leafy vegetables. Of course, it is not the sole source of their vegetable needs, but I believe it is the start of something. I can see them creating a larger greenhouse elsewhere that could eventually supply the restaurant. I like the idea but it can be even more. It is a very proactive step that is much more than a mere gimmick. In addition to the bar, there is a more private bar experience in the Jack Daniels Room, which I fall in love with immediately. It is occupied by a group of 6 people. I like the semi private nature of the room. Floor to ceiling glass ensures this. I see so much potential here! Just before dessert, we head to the bar for a Cuisinero Uno Old Fashioned. Ahmed, the mixologist, who is really laid back, crafts our old fashioned with flames and smoke. Yes, this is quite popular these days, but it is nicely executed nonetheless. I am struck by Ahmed's sincerity, but I hope to see him own the bar more; you know, make it is own by adding an edge to his interaction with people. For dessert, we have the Molten cake, with a decent enough centre that oozes out, much like it should be. Notwithstanding the masses' penchant for sweet chocolate, I think a darker chocolate does more justice to this dessert. But I understand the need to create dishes that pay the bills at the end f the month. Chef John. I must say, finds a balance between those bread and butter dishes that generate income and the ones that allow him to express himself in a pure way, free from commercial concerns. We try one other dessert and I reckon it is is a simple and inexpensive winner - a trio of sorbets. At 18AED each, I think you should go for 3 to bring out the contrast in flavors. But do them in order, starting with the 'chilly', pun intended, Jalapeno flavoured sorbet, followed by the Earl grey and end with the Strawberry. What I am not telling you is the other flavours that infuse these sorbets. That you must discover. After dessert, we are treated to one last bit of showmanship as Chef Arnie treats us to the Nitro meringue, a post-dinner memory maker if you will, that in many ways serves to remind me, as if I needed reminding, what an exciting restaurant this is. Why shouldn't have a lot of theatre and engagement? 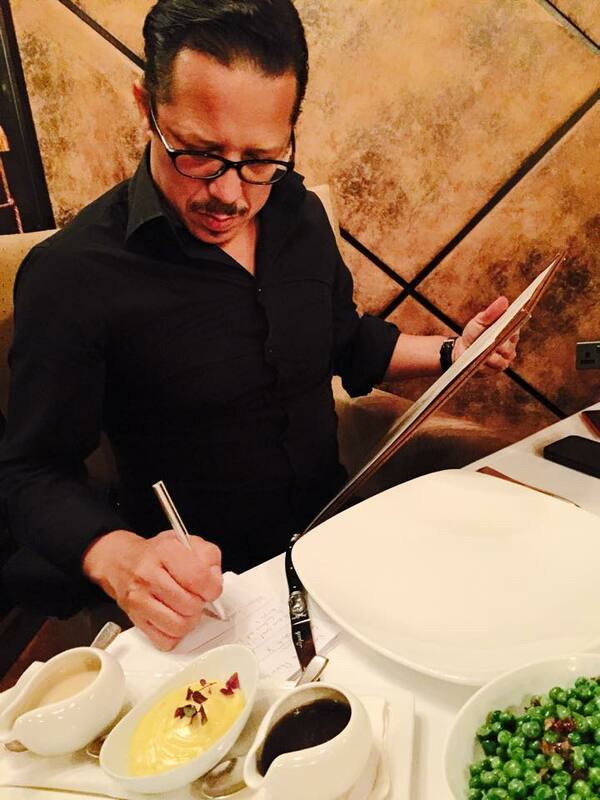 Cuisinero Uno, Chef John Buenaventura's vision realised, is so much more than quirky. I think it will be easy for some people to focus on the 'cool' off the wall elements like his take on the Chef's table (we certainly don't have this set up in Abu Dhabi), the aquaponics and hydroponics greenhouse that is certainly a unique aspect of the restaurant, the funky graffiti, the Jack Daniels room... In doing this they may forget that the food is actually very good. 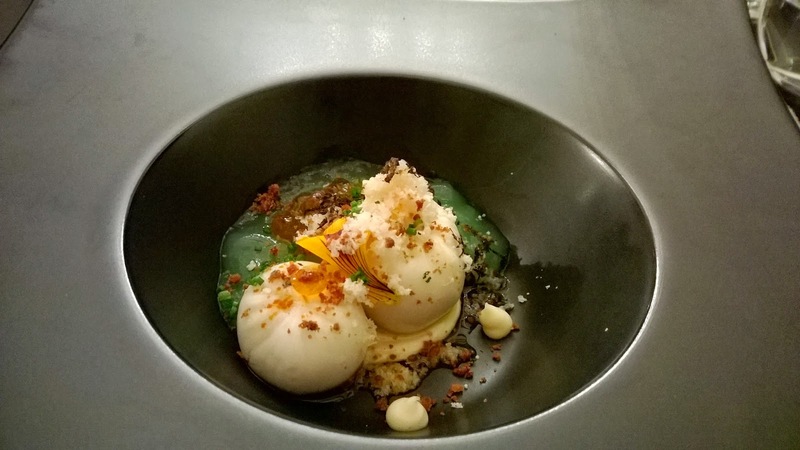 It is the exciting combinations that make an impression on me and notwithstanding Chef John's fine dining background, he manages to keep things casual, but I love the moments when he reveals a bit of his past in his dishes. At age 32, he has the energy and zest for creating that will stand this restaurant in good stead. And that bodes well not only for his investors, but for diners visiting Dubai.